The maquette is available now. What saddens me is that this is the final version. No Palpatine? Biker Scout? Snow Trooper? Tarkin? Ackbar? Any imperial guy in grey or black? Rebel blockade soldiers in waiting pose ready to shoot the invading stormtroopers? Luke in ANH outfit, with one foot on the rock, looking at the twin suns? Lando? Dooku? Ewoks? UPDATE: Mr. Anonymous posted a correction by saying that this is only the last piece from the Clone Wars series and that there will be more from the Original Trilogy. SWEET! 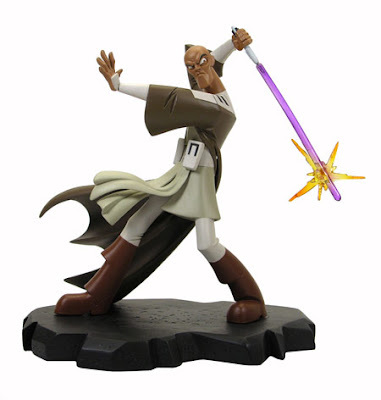 this is only the last Clone Wars maquette, they will still continue to pump out animated maquettes based on the other star wars properties which saddens me greatly, as i would've much rather gotten more Clone Wars characters (especilly Foul:-( ) then OT people. That's awesome, thanks for the correction!